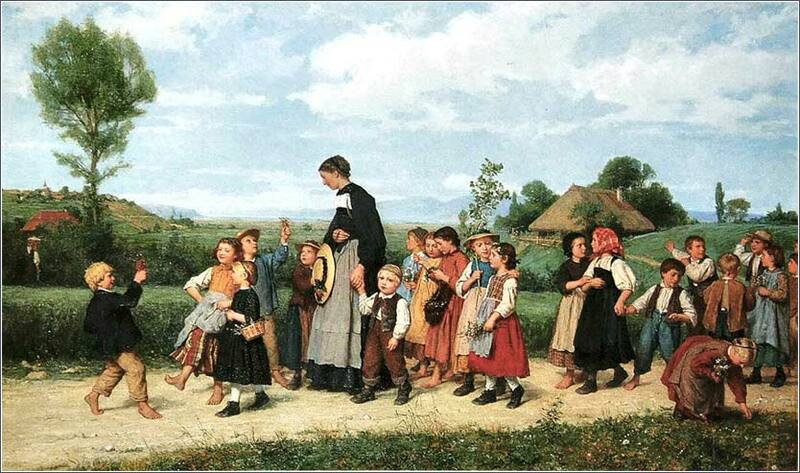 The Sunday School Walk by Albert Anker (Swiss), ca. 1872. 285 people in our community are currently praying with you. Take my hand precious Lord, lead me home. Lift up my mind above all these little things below, which are apt to distract my thoughts; and keep it above, until my heart is fully resolved to seek You every day, in the path where Jesus has trod before me. Glory to God whose power, working in us, can do infinitely more than we can ask or imagine: Glory to God from generation to generation in the church and in the world, and in Christ Jesus for ever and ever. 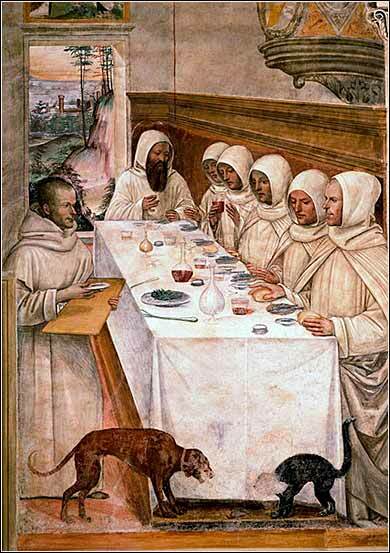 St. Benedict and His Monks Eating in the Refectory, fresco by Luca Signorelli ca. 1505. Benedict renewed emphasis on the vow of poverty for monks. The first seems straightforward enough. It is what an attorney would call a rule of procedure, telling us what to do when a brother has committed a sin against us. First, talk to him about it in private. If that doesn't work, take one or two other people with you and go talk to him a second time. If he still will not relent, involve the entire church. And if he is obdurate in his sin, “treat him like a Gentile”, i.e. banish him, consider him unclean, refuse to enter his house or take a meal with him. Comparing the exclusion of a person to the treatment of Gentiles sounds a bit odd. Christ has already shown that his salvation will include the Gentiles, specifically when he traveled outside Judea to a Gentile country and healed the daughter of the Samaritan woman in Matthew 15:21-28. Not to mention, his destiny has been frequently prophesied to bring salvation to the entire world, e.g. Isaiah 42:1 or Isaiah 49:6. But He is talking to Jews here, as a Jew himself; referring to Gentiles in this manner is simply a shorthand expression that the listeners understood immediately. We should read this as saying, “let him be to you as a Gentile is to the (unconverted) Jews”. The concept of saving the Gentiles is still in its infancy, though. Even though the word Jesus uses is translated as “church” here, the “church”, as we think of it, will not exist until after Christ has ascended to heaven and the Holy Spirit comes upon the handful of true believers. We must understand, perhaps, that a church existed during Christ's life but would necessarily change after he ascended to heaven. The immanentImmanent is a theological term referring to God as being present in our world of time, space, etc., so that we can know Him directly. The opposite term is transcendent, that is, completely beyond our ability to understand or experience. Do not confuse it with “imminent”, meaning “about to occur”. power of the church today rests with a different person of God, the Holy Spirit, and so underwent some transformation at the time of the Pentecost. The final promise, that where two agree and ask for something, God the Father will grant it, causes considerable embarrassment to churches, which must explain why parishioners who engage in group petitionary prayer do not get what they asked for. For the purposes of this verse, it is sufficient to say that the promise was made specifically to the twelve apostles. The promise that when two or three gather together in the name of Christ, He will be there among them, however, is made generally to all believers.